At the Institute, weldable high-strength steels have been created - altogether over 30 grades with different mechanical properties, cold resistance and a wide size assortment. The steels developed allow satisfying practically all demands of the industry for weldable structural materials and successfully competing with the best foreign counterparts that have found wide application, such as Weldox-700 and Hardox-400. 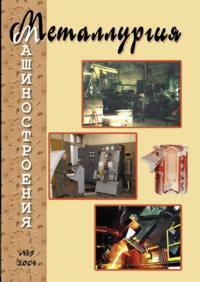 Based on investigations in the field of the process of vacuum arc melting of refractory metals and manufacture of specialized casting production equipment, conducted by specialists at NIAT and OAO Elektromekhanika, a network of foundry facilities for casting refractory metals in the aircraft industry has been created, new design solutions and calculation methods allowing to maintain optimum process conditions with high precision have been developed. The right choice of an induction furnace is a guarantee of protecting the workers against exposure to electromagnetic fields. Analysis and comparison of magnetic field intensity measurements on operating platforms of furnaces with regulated documentation - domestic and foreign - are given. Industrial experiments for revealing an effect of the complex master alloy AKCe on the quality of finished products from grade 15ChMA steel show that the microalloying of serial structural steels is a very important reserve for the further improvement of finished product quality, enhancement of physical-and-mechanical and performance characteristics. The article presents the result of scientific investigations into the structure of liquid metals and alloys in a wide temperature range from the position of existence of fractal clusters, fullerens. A concept of the theory created by the authors is given. The article presents a method of nondestructive check of the degree of cementite formation in gray iron. Its physical essence is based on the exposure of the material of the medium to be tested to a narrow beam of gamma-quanta of the 137Cs radionuclide. The main advantages of the method include the high speed of checking (duration of determining cementite in a sample is 3 to 5 min), providing information on the Fe3C content through the depth of the chilled layer, and possibility of implementation in an industrial variant. The proposed method may be promising in the machine-building industry. Work has been carried out to establish dependence of cold resistance of castings on the contents of the basic elements in a metal corresponding to the basic steel grade 25L. In particular, it is recommended to have minimum C, Si, P and S contents, and when making steel in an acid induction furnace - from 0.03% to 0.06% Al and from 0.75% to 1.20% Mn. Effect of heat treatment on the linear expansion of cold-shaped commercial aluminum A7 and high-purity aluminum A99 with different initial hydrogen contents has been studied. It has been shown that such treatment can lower their coefficient of linear expansion at different test temperatures. A detailed analysis of spring washer heat treatment conditions with subsequently applying a protective coating is given. Conclusions are made and recommendations are given for practical application of results. The recommendations have been verified under industrial conditions. The conclusions have been fully confirmed in treating a great number of washers for a long period of time.